(Shearsman Books 2015); pbk, £9.95. If there was ever a poetry book that felt like a workout, this would be it. I don’t mean workout in the sense of a laborious or stressful task, but as a highly stimulating read. Mark Goodwin’s House At Out exercises the mind in every sense of the word. 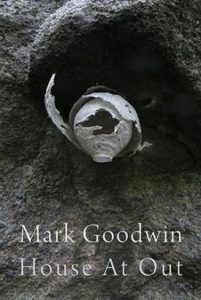 Mark Goodwin is a poet and self-described sound-artist from Leicestershire interested not only in the meaning and aesthetics of words but also in its sound, reading and performance. Many of his poems, including the pieces in this collection can be enhanced by a digital sound album, accessed online. House At Out contains new and old work. There is never a dull moment. Each poem offers something unique and refreshing. Goodwin’s poetry draws attention to itself by making the reader pause, re-read and re-consider more than most. This is poetry which, at its heart, is an acute observation of words, syntax, word patterns, cadences and rhythms. A dynamic example of this is in “II Moving Conversions” from the poem “Moving”. In work that so heavily dependent on how to render sound on the page, it is important not to forget about Goodwin’s beautiful natural imagery in poems like “Flattened Shop” where “a bird’s sweet painted flight on tin/ cherry blossom & far orange sun…”. Sometimes, Goodwin’s imagery is beautifully obscure; his skill as a nature writer (indeed he spends much of his time outdoors as a walker, climber and “experiencer of place”) sheds light on natural landscapes in a unique and sensitive light. Here is poet who knows the role of word play, rhythm and sounds better than most. House At Out exercises the mind and makes the reader work by not giving away anything easily. The dynamic quality of Goodwin’s work means it lends itself to reading, performing and listening repeatedly.